:'If you've picked up this book I'm guessing you've got a heart for God, but sometimes life can get in the way of your best intentions. We all want to experience love, wonder, beauty, joy, and creativity, yet our reality is often something very different. We would like to feel more connected to ourselves, to God and to other people, but often we can't see how this could be possible. Wherever you are in your spiritual journey right now, it's OK. God meets us where we are; all he asks is that we show up for our part. The miracle of the day is already yours; the adventure begins when you're open to experience it fully. 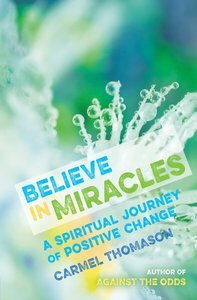 'This book takes you on a 40 day journey into a world of possibility. Focusing on small practical steps, it offers a series of short exercises to promote lasting changes, leading to a more prayerful, contented and connected life. By looking for the good and focusing on actions to take now, you will learn to view differently your daily circumstances, your relationship with God, and your relationships with others, bringing something of the ways of heaven to Earth. Carmel Thomason is a journalist and writer based in Manchester. She is the author of Every Moment Counts: A Life of Mary Butterwick, which was listed in the top ten Christian books in the Church Times, WH Smith and Amazon, and has collaborated with the Archbishop of York, writing the stories for John Sentamu's Faith Stories, both published by DLT. Carmel has also contributed to the The Way, The Truth and The Life series published by the Teachers' Enterprise in Religious Education.